SkyBridge helps organizations meet the challenge of ongoing ERP maintenance and support with a range of services designed to substantially lower their maintenance costs and ensure timely response and guaranteed service levels. 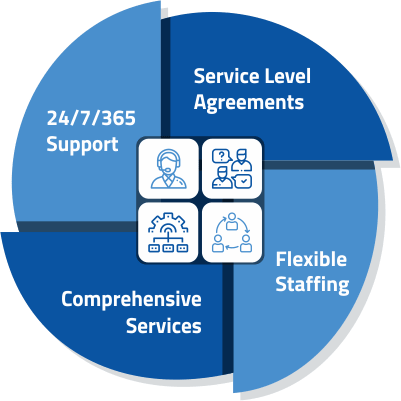 With over two decades’ implementing, updating, and supporting ERP applications no one is more qualified that SkyBridge to be your round-the-clock managed services partner. We ensure that your applications stay up and running within specified SLAs and that all issues get resolved within agreed-to timeframes. SkyBridge provides both 24/7/365 application remote monitoring, in addition to on-call helpdesk support should issues arise. When issues occur, in almost all cases, we are able to identify, diagnose, and correct an issue before users even become aware of it. With teams staffed across our U.S. and offshore development centers in India (Hyderabad), SkyBridge can serve as an extension of a client’s support team, or provide turn-key, 24×7 services. Our staffing model includes a ‘Shadow Team’ approach, supplementing your core team as necessary. SkyBridge carefully outlines service level requirements, customizing our maintenance process for unique client needs. We bring to each project a strong methodology for application maintenance, based on the Oracle Unified Methodology. Stability, long-term support, technology competence and reduction in Total Cost of Ownership are few of the benefits enterprises will accrue from our Support and Managed Services.